I know that the recommended treatment is West Systems 105 Resin with the 207 Hardener. And Lee Valley sells it. Will the 32oz / 10oz containers (totally about $150 with taxes) be enough for 1 canoe? 2 canoes? And what if we just use bondo? 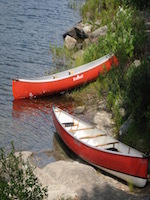 These are old beater canoes that our Scout troop owns. They were all donated and fixed up by us. I've read varying reports on bondo. Basically we want to sand the surface and then use a paint roller to apply the mixture evenly like I see in the youtube videos. Never actually done it before. I'd been debating this recently. For the price of the epoxy, I'm thinking I'll just put that money toward having my canoe refinished by a pro. In the meantime, I saw this Bondo product on sale at CanTire a few days ago. It cures in the sun without any hardener. Some might scoff at using this (I'm no handyman) but it actually feels pretty solid. I just touched up the worst spots. Small gouges and deeper scrapes. On clearance for under $10. I've watched a few videos on youtube and it looks pretty easy to do the whole thing with a proper 2 part product. You mix it up in a cup or jar first and pour it on then just roll it out with a paint roller. That's after doing surface prep. What type of canoe? Epoxy resin like Souris River? Gel Coat? Patch the cracks with epoxy and glass if needed, prime the whole canoe, and paint with marine paint. One litre will do two coats and leave a little for touch ups. Like Neil said, save the epoxy for epoxy boats. Don't do what? Don't do it even with bondo? It is a Scott canoe with gelcoat and there is one area on the side that is pretty banged up. It is usable as is but I want to prevent further damage. Perhaps I'll take some pictures and a video. It needs more than paint. and as far as the paint goes I don't care what it looks like. So it does not need paint. The "ideal" approach is to find out what resin - epoxy, polyester, ?? - was used in the original construction and use the same resin in the repairs. West Systems is one of the preferred epoxy resins. Other options are MAS and System 3. However none of them would work well over top of a polyester resin. Way back when, my Dad and I patched up a beat up Scout canoe with generic epoxy and filler from Canadian Tire. It looked good when we finished but the patches were all banged off (and new damage added) after the next Triathalon run down Bronte Creek. (There was a Venturer/Ranger triathalon that used to run in Halton Region that involved canoeing/kayaking down Bronte Creek, biking up to Crawford Lake and then cross country run back to Mount Nemo Scout Camp). Just a quick note, epoxy resin will work well over polyester, but not the other way around. I have repaired a few polyester boats with epoxy. Pics of your canoes would help the suggestion factory. It is a Scott canoe maybe 25 years old. Chopper gun style I'm pretty sure. I'll post some pics. That's good to know, I thought they were mutually exclusive either way. How about over a vinylester? I use RAKA epoxy for canoe building and repairs; high quality at good prices, although tough to get across the border without getting nailed with duty. 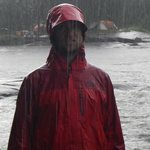 Noahsmarine.com will carry everything else you could need. It sounded like you were going to skin coat the whole canoe with epoxy. That's why I said don't do it. With a felt draw a circle around the damage/hole/crack. The more circular, the better. With an angle grinder I will remove all of the gelcoat within the lines and the lines themselves. I use cloth but for this I would use chop for simplicity. Mix up epoxy or fibreglass resin, brush on a layer to the hole, throw on the patch, barely wet it out, throw on second patch and barely wet it out as well, let dry. When dry mix up another small batch of resin and brush on to fill the weave and small gaps. Use two coats for a very smooth finish. Mask off, prime with proper primer, and two coats of marine paint. The better prep you do, the better results. I know epoxy has worked for every material I've ever worked on with boats. Including many plastics. I think bondo is for cars. As I noted above, the 3M site says Bondo is used for boats. That said, tonight we did a first pass on one canoe and I'm no longer sure we have to do a full resurface. I'll post some pictures and video in the next few days. Though I do think we should redo the bottom. Luckily one of Scout leaders has a brother with a sail boat who has learned to do a lot of repairs over the years, so he came and helped out. He had some West Systems and that's what we used. Hi Propector16, There are many products available on the market for any type of application. Bondo is not the way to go for hole or resurfacing jobs. The marine industry has specific products depending on size of repair, strength desired, and surface area to be covered. (on top of being an avid tripper, I am also a Yachtsmen and own a '86 CS 36T sailboat, I do an enormous amount of gel coat and fiberglass repairs for both myself and others. I have been restoring the sailboat one one project at a time in between seasons). What are you trying to repair exactly, holes, scratches in gel coat, deep gouges from rocks etc? and how large would the average one be? If you have a pic of the damaged area, that would be great, then I can recommend the easiest and fasted product to use for your application. No point in resurfacing the entire bottom if you don't have to. As someone else mentioned, just repair what you need, blend in the repair and then paint the repair area or whole canoe and it will be good as new. Today's products are far superior to what they used 10 -20 yrs ago, so it will be very strong.